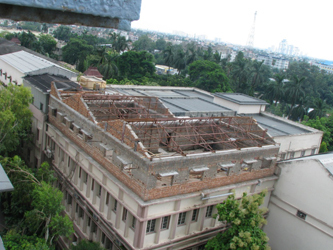 November 7, 2012, Wednesday, Jadavpur University, Kolkata, India. Despite busy schedule with shows, Manick Sorcar gave time to continue teaching laser animation at Jadavpur University. This was the first of a series of lectures he was scheduled to deliver as a visiting teacher in 2012, where his brainchild ‘Laser Animation for Art and Entertainment’ course is a part of illumination engineering and electrical engineering. Apart from the M.Tech students, the class was attended by other laser enthusiasts including professors of Physics (Laser), illumination engineering, and laboratory technicians. On this day, first few Chapters from his book “Laser Lighting for Art, Animation and Entertainment”, were covered to introduce the basics of laser, laser safety, and its application in the construction of a laser projector inside a laboratory. The next session will cover its operation, while the further sessions would cover animating and art issues. “Laser animation is a pure combination of science and art”, Manick said, “I have no doubt, you will handle the technical part with great efficiency as you are already a student of technology. Regarding art part, one does not need to be a skilled artist, but needs imagination and wake up the artistry that lies within every human being. I will teach you how you can combine the two”. The class ran for about two hours, before it was adjourned. 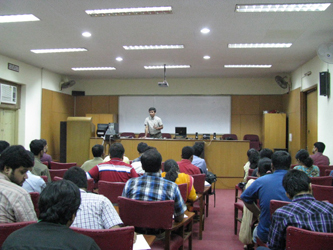 A year earlier, on March 25, 2011 the animation course was formally introduced at the university. 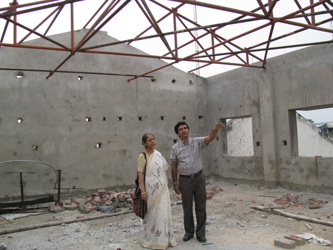 The university-funded laser animation laboratory, where Manick donated all laser equipment, is under construction and is expected to be completed in 2013.